Here’s my lightened version with fresh green beans, a touch of cheese, and the new Seneca Crisp Onions. A unique vacuum processing method using canola and sunflower oils makes crispy onions that are transfat-free and 30% less fat than comparable snacks. 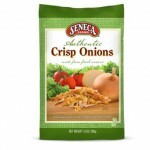 Seneca Foods, known for premium brand canned fruits and vegetables since 1949, also makes snacks with Washington state apples and sweet potatoes. My Spicy Party Mix of sweet potato chips and crisp onions is an irresistable munchy on T-day. Happy Thanksgiving! Makes: 6 servings about 3/4 cup each. Recipe can be doubled for 9×13-inch pan. Trim and cut fresh green beans in half lengthwise or crosswise. Place fresh or frozen beans in a 4-quart saucepan or 12-inch wide skillet. Add 1/2 cup water; cover and simmer 5-7 minutes until just tender. Drain well. Transfer beans to an 8 or 9-inch (2 quart size) baking dish. In the same pan, whisk milk and flour. Add mushrooms, salt and pepper. Bring to a simmer over medium heat and cook 4-5 minutes until sauce thickens, stirring frequently. Stir in 1/4 cup crisp onions and choice of cheese. Pour over beans and mix lightly to combine. Bake uncovered 25-30 minutes until bubbly. Sprinkle remaining 1/4 cup onions on top just before serving. Pass additional crisp onions if desired. Per serving: 140 calories, 6g protein, 18g carb, 5g fat, (1 g sat. fat), 5mg chol, 340mg sodium,2 g fiber. I just posted about doing things a little out of the ordinary for Thanksgiving, too! Let’s hear it for rocking the boat. Have a good one, Rosemary. Neat, I love your Cranberry Revolution, Jill! I’m all for shaking up Thanksgiving menus, but keeping some tradition too.